A friend and I went for a walk a couple weeks ago at a pond in Birmingham. It was a nice little neighborhood and I think I’ll return for another walk soon! As with any pond, there were ducks. The friend I was with told me about the time that she once stole one of the baby ducks from that pond, and took it home under her shirt. Needless to say, her mom made her return it. I noticed this sign, although I might have ignored it, since I’ve never met a duck that didn’t enjoy diving into a nice piece of stale bread. The thing I noticed was reason number 1…check it out. 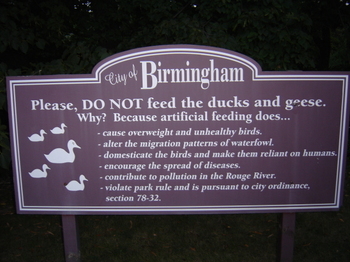 I guess it struck me as funny because the city of Birmingham is most concerned about the weight of the birds, over everything else. Hah! Go-B-ham! I am so proud of the city I work in. We are concerned about the physical health of humans and animals. How sweet is that! What park/pond were you at? my friend said something about Quarton Lake…up by Quarton and Woodward, just NW of downtown Birmingham…I might be able to find it again.